There was a moment late in this season of “Homeland,” when Carrie Mathison's CIA colleagues were trying to track down the terrorist mastermind Abu Nazir. The analysts were looking at security camera footage of Nazir in a gas station, his SUV visible through the station's front window. With a few clicks of the mouse and keyboard, grey lines started to streak across the screen as the monitor zoomed in on the car's license plate. In a few seconds, the plate sharpened from a pixelated blur into a high-def, perfectly legible close up. On a show that (at least until this season’s last few episodes) took pains to appear realistic, the images on that computer screen—the crazy zoom, the strangely elegant moving lines, the sudden sharpness of the image—were hilariously, irritatingly implausible. As anybody who's dealt with grainy footage, or, for that matter, used a computer, knows, this sequence of extreme sharpening is impossible: At a certain point, a blurry image is just a blurry image. Even if you could zoom in to such a dramatic degree, the process would involve staring at a clunky interface with lots of buttons and tools, and it would doubtless be long and entail a lot of spinning icons and the word "rendering." This moment exemplifies a disorder that afflicts almost every single TV show or movie ever made about spies. From Mission Impossible to Enemy of the State to the Bourne movies, whenever analysts use computers, their screens are almost always filled with flashing dots, animated maps and 3D models. Unless Hollywood has access to secret, elaborately designed spy technologies that the rest of us can’t see (I'm looking at you Kathryn Bigelow), I think we can be fairly certain that these flourishes don’t exist in real life. But more worryingly, they also convey a troubling message about espionage itself. Hollywood has always loved making things flashier than they are in real life. Hackers and Tron, for example, are about as accurate in their depiction of computing as Kung Fu Panda is in its depiction of pandas. But over the last several decades, with the rise of CGI and the shrinking of our collective attention spans, the level of flashiness and jumpiness on-screen has reached new heights. As Vivian Sobchack, a professor at the UCLA School of Theater, Film and Television, puts it, it's a symptom of "the increasingly kinetic thrust of spectacle" in Hollywood movies. That's how you get scenes like the ones in Mission Impossible III, where characters are introduced with shots of a flashy screen filled with animated bars and moving headshot photos, or the many scenes in Bourne where evildoers stare at fancy digital maps in secretive operations rooms. Or the sequence in the most recent Bond movie, Skyfall, where Q, played by Ben Wishaw, tries to prevent a hack attempt on MI6's computer system. Rounded shapes, numbers and letters flit across the screen, before transforming into a 3-dimensional shape that looks like a chromosome and changes color for no discernible reason. This same tendency to overdramatize technology exists, albeit in a much more subdued way, throughout “Homeland,” especially in shots of the operations rooms during the first season, where the on-screen information was often presented using highly designed, animated, integrated interfaces. The second season has been more subtle, but still contains some conspicuously exaggerated uses of technology. Characters use suspiciously elegant facial recognition software; look at beautifully designed screens superimposing a suspect's headshot with a flashing location; and use a Matrix-like interface to stop the vice-president's pacemaker. In one of the season's later episodes, Brody video conferences with Abu Nazir using Skype on his Blackberry, a feature that, at the moment at least, does not exist on Blackberry phones. This latter complaint may seem petty, but it also points to the fact that, in many cases, movies have extensive product placement deals with technology manufacturers, and exaggerating their capabilities helps to sell smartphones and laptops. Of course, in real life, technology is rarely exciting. For the most part, we use computers by ourselves, hunched over kitchen tables or our office desk. Things break, and take too long, and our screen freezes when all we're just trying to do is watch the trailer for The Hobbit. Over the past decade, our familiarity with technology has increased dramatically, to the point that computer interfaces are one of our primary ways of interacting with the world and each other. That's why these misrepresentations are especially jarring: They misrepresent something that is fundamental to our everyday lives. Imagine if every time someone drove a car in a movie it was a Ferrari that spewed flames and put on a laser light show. More seriously, this depiction of spy technology as unrecognizably sophisticated and beautiful feeds the notion that government agencies are mystical and magical entities. This may scare off the potential terrorists, but it also makes it harder to see intelligence work as something that exists in the real world, with all of the drawbacks and moral ambiguities that come with it. In real life, satellites can't be automatically programmed to follow a specific person, cell phones can't be tapped at the click of a button, and people's computer interfaces look hideous and lame. Sometimes technology fails, and tedious on-the-ground research is required to find out what's actually going on. "It's the same thing that happened with CSI and forensics," Rick "Ozzie" Nelson, a senior fellow at the Center for Strategic and International Studies and a former counter-terrorism official, tells me. "When the government can't find a bad guy or doesn't know when something bad is coming, people think the government let them down because they believe it has access to technology that doesn't exist." It also, conversely, encourages people to think of the government as Big Brother—see, for example, Enemy of the State, in which a government agency chases down Will Smith. Even if you disregard the flashiness, many of the screens shown on TV shows and movies exaggerate the level of integration among different government databases, Nelson explains. On TV shows, including "Homeland," analysts will often pull up a screen showing facial recognition, fingerprinting, criminal histories and surveillance videos of suspects all from one central interface. "That level of integration is not possible on an operations floor," says Nelson. All of that information, he points out, would come from a variety of databases, and require separate, often laborious analysis. As technology continues to become ever more tightly enmeshed in our lives, it's possible that we'll start demanding more accurate depictions of it in the movies. Or, perhaps, fictional technology will only continue to become more outlandish, as we come to expect more and more and more. As Sobchack puts it, at this point, "new technologies aren't even novel anymore"—they get old before they've even hit the stores. 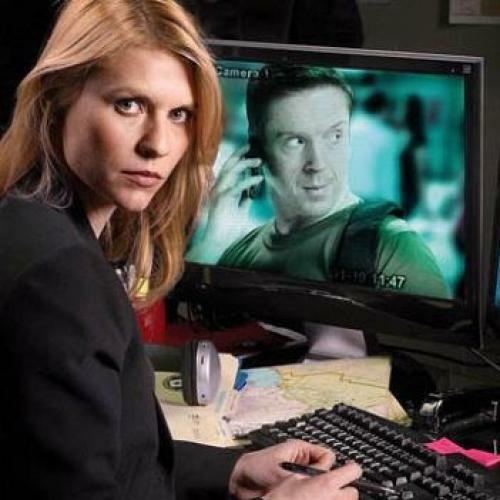 But for Carrie Mathison and other on-screen spies, technology can already do everything they would ever want, and, like the fictional spies themselves, look extraordinarily, unrealistically attractive while it does it.